The AGM and final race of the year was held again and boy does that seem like it came around a lot faster this year. Unexpectedly, we had a bit to discuss regarding classes we might like to shelve for the 2019 racing season and those new classes that we would like for next year. It was a tuff decision as the current 2018 line-up had something for everyone. Although there were a lot of discussion in the end we stuck with 3 groups of 6 classes and shelved only 3 of the classes in total. Listed below are the changes to classes for 2019. SCX/Carrera DTM, although a popular class it was decided to give this class a break for the 2019 season. Both the FJs and Home Built classes will be lexan bodies on either a scratch built chassis (no metal chassis), plastic adjustable chassis or kit bashed (as it were) from another model. Basically Scalextric running gear, 18k motor in line, 27/9 gear ratio and open guide blade. While the Group A Super Tourers are open to any Group A Super Touring car, from 1982 - 2000 era. Well that wraps up the AGM for another year! See you in the New Year. The AGM and final race of the year was held. Listed below are the classes for 2018. Classic NASCAR, NASCAR, N.Y. Modifieds, SCX/Carrera DTM, Classic Ninco Touring Cars and Scalextric V8's. The AGM and final race of the year was again held at my place. There was a lot of discusion over what we will race in 2016 however, the majority of members agreed to cary most classes from 2015 for another year. Listed below are the changes to classes for 2016. Scratch built have been dropped for 2016, however members are more than welcome to bring them along to any meeting and if time permits a 7th class can be run on the night. Rules for this class are open. Thundercars (no scaleauto or sideways), motor limited to 18k (including H&R Hawk motor). Hope you all have a great year ahead, regards Rick. After quite a few years, our current arrangement for web hosting has come to an end. Subsequently, the group has agreed to pay for a web hosting service to continue the website at the last Scalextric ACT race meeting on 19 June 2015. I can now report that both the CSC and Scalectric ACT websites are now on the new host server. I would like to take this opportunity to thank Richard (owner of Dualstream) for his support over the years. The AGM was held at the last meeting of the year and was hosted by Rick this year. Again, the AGM was short and sweet and we all agreed on the following changes to the line up for 2015. In bringing some new classes in we had to forgo a few favorites such as trucks but we had made a decision to give them a rest for the year with the view to bring them back in 2016, these are the new classes for 2015. Ninco Classic Touring cars (the original Nincos: Alfa Romeo, Opel Calibra, Mercedes, NC-1 powered). Classic Bathurst (Toranas, Falcons, Cortinas, Minis. Can be re-motored with a slower motor if desired). N.Y. modifieds: for the ovals. Classic F1, Classic Sports, Classic Le Mans, Modern Le Mans, Super Tourers and super 7. Classic Rally, V8/Utes, 2 Litre Tourers, Muscle Car Tourers, G.P. Hero's and Classic Bathurst. Classic NASCAR, NASCAR, Ninco Classic Tourers, 1:32 Scratchbuilt 1:24 Scratchbuilt (Formally modifieds) and N.Y. modifieds. A couple of new sections have recently been introduced to the website that include How to and Tech tip articles. Go to both our How to and Tech tip pages to find out more. 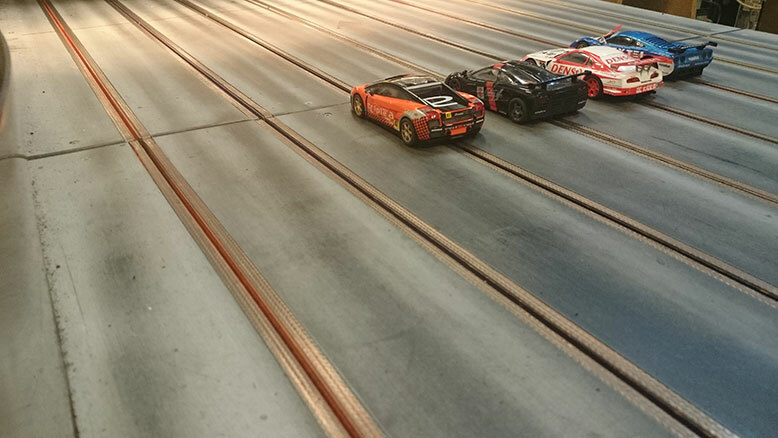 A new website has been launched for Scalextric ACT. On the website you will find all the latest newsletters for 2013, Rules and Classes for this year. For more go to the Scalextric ACT website. We will be introducing 3 new classes for Group C to race on 21 June. Go to our Group C page to find out more. The inaugural CSC race meeting! The inaugural race meeting of the Canberra Slotcar Club will be run on Friday 26 April. Join us for for a pre-race meeting where we can do any fine tuning to both, cars and the rules that are required prior to the clubs official kick off on 26 April. We will be sending you telepathically more details soon! Please follow the links bellow to read the draft rules. You can also print these rules using the print button in the right hand menu from any of the pages. A new club is born in 2013! After several months of toing and froing a small group of guys have decided to start up what will hopefully be Canberra's third home race track club.